Was the Scottish Green Party’s Scottish Parliament election campaign in 2003 an example of a ‘great green campaign’? In many ways, no. 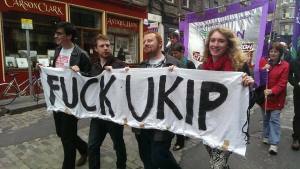 We had very little money, few activists outside Edinburgh and Glasgow, a tiny and damp national office, two paid staff members, and generally had to beg or borrow resources (including sometimes having to rely on the WiFi from the Pub across the road to send press releases). However, despite the campaign being light years from the slick professionalism of later Green Party campaigns, our efforts were incredibly successful. We went from one MSP in Lothians in 1999 to MSPs across almost the whole country. To my surprise I was lucky enough to be one of those MSPs. I had taken on the role of election co-ordinator in the hope that we could significantly increase the number of Green seats, but having done the maths concluded I wouldn’t be one of them. 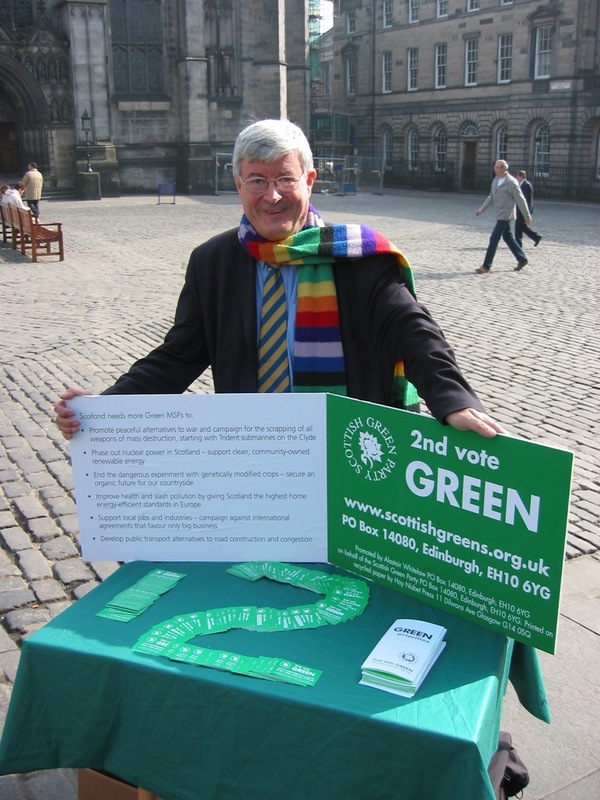 However, the Greens actually topped the poll on the list in Edinburgh Central constituency, which gave us enough votes to elect a Green list MSP on its own, and the votes from the rest of Lothians ensured that I would be joining equally unexpected new Green MSPs from places like the North East of Scotland in the Parliament. I think it’s worth clarifying exactly how meagre our resources were. Let me put it like this – 18 months before the election, at our Scottish party conference in 2001 I did a presentation to conference on future election strategies which concluded with a prediction that the Scottish Greens could, in the right circumstances, elect up to 5 MSPs at a future election. Since that amounted to one member of the audience in seven, because there were only 35 members at conference, this was greeted with some scepticism. Actually, the proportions turned out to be even higher – if you attended Scottish Green Party conference in 2001 you had a 20% chance of being an MSP in less than 2 years time. So why did we do so well? In my opinion there were two reasons – we had a very simple, but very effective campaign message,which we stuck to rigidly, and we were incredibly lucky that the campaign message turned out to be exactly the right one for the election we faced. The 2003 election campaign was a strange one. It was clear that Labour and the Lib-dems were almost certain to be re-elected in sufficient numbers to form the new government. People felt that they deserved another 4 years as part of the parliament’s bedding in process. The SNP, under John Swinney, didn’t seem like serious contenders. They weren’t ready for government, and people weren’t ready for them to govern. The opening stages of the Iraq war were creating a real anger among Labour supporters. The election system was still very new, with little understanding of the workings of the region lists – and little in the way of a list strategy from the traditional parties. 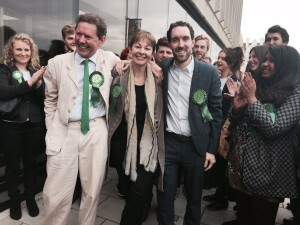 Into this terminally dull election campaign came ‘2nd vote Green’ – a slogan that didn’t ask people to abandon traditional loyalties, but instead gave people the option of ‘putting some colour into the parliament’, without altering the outcome. In the context of a non-squeeze election, with a real anger among traditional labour voters who would not have countenanced voting SNP, the slogan was perfectly timed and perfectly placed. So our campaign was basically to repeat the mantra ‘Second Vote Green’ whenever we had an opportunity. Of course we also talked about traditional green themes, but this was, for us, a very un-confrontational green campaign. On issues like of opposition to GM, trident and illegal wars we were in tune with a large section of the electorate. Of course our other huge asset was Robin. In Robin Harper MSP we had a living personification of our campaign. Where Tommy Sheridan was fire and fury, Robin’s enthusiasm and general niceness, was very much in tune with the idea of new politics for a new parliament. “Not sure to do with your other ballot paper – why not give it to the nice man with the Dr Who scarf?” was the subliminal theme to the campaign. By the end of the campaign I imagine Robin would have been unable to pop out to buy a pint of milk from a corner shop without reminding the bemused shop assistant “and that’s why you should Second Vote Green”. 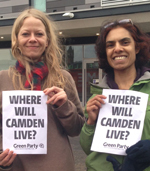 So the second vote Green windmills, postcards and leaflets had been handed out. Recycling bins and cycle racks sported second vote green stickers. Standing at the top of Waverly steps outside Edinburgh’s main railway station the day before the election, something remarkable seemed to be happening. As I handed out our little credit-card sized second vote green pledge cards a remarkable number of people were saying “I just might, you know”. 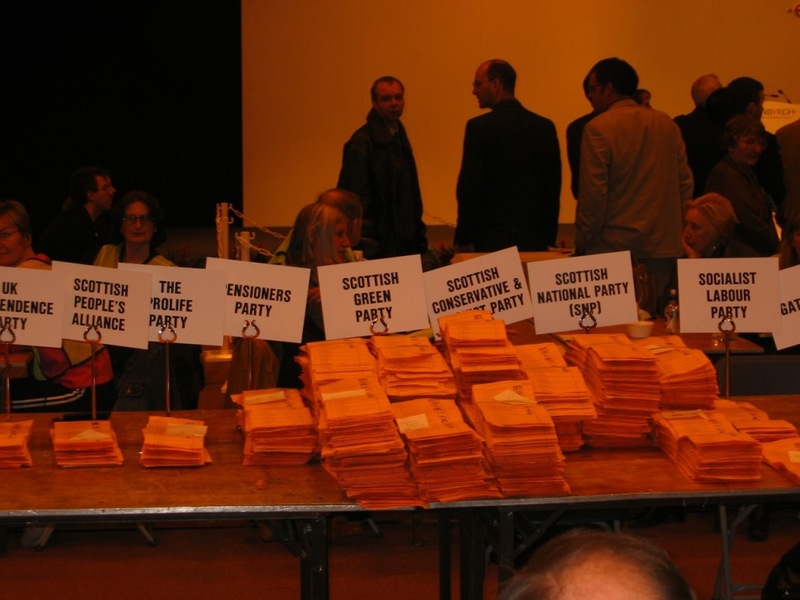 I went to the count in a state of trepidation – could be get the five MSPs I had rashly predicted? The votes started to be counted, and as the Green piles got higher and higher the Green contingent started to buzz with excitement – shortly after cheering Patrick Harvie’s election to the rafters I was taken to one side and told I was in no state to be elected as MSP. I was sent home in a taxi to shower, shave and iron a shirt. At about 4am I was duly declared as an MSP for Lothian, and stumbled out to celebrate with Heather, Karen and Robin outside as the sun rose. Like Mark, I has heavily involved in the 2003 campaign, as chair of the Election Steering Group. It was very effective and I am very proud of what we did. But it worked because of the favourable conditions and the fact that no other party – especially SNP – had clicked onto the importance of the 2nd vote. Our campaigns in 2007 and 2011 were, in most ways, better by far, but lacked the favourable conditions. But I think ‘2nd vote Green’ has done its job. Its where we move to now that is the interesting bit.